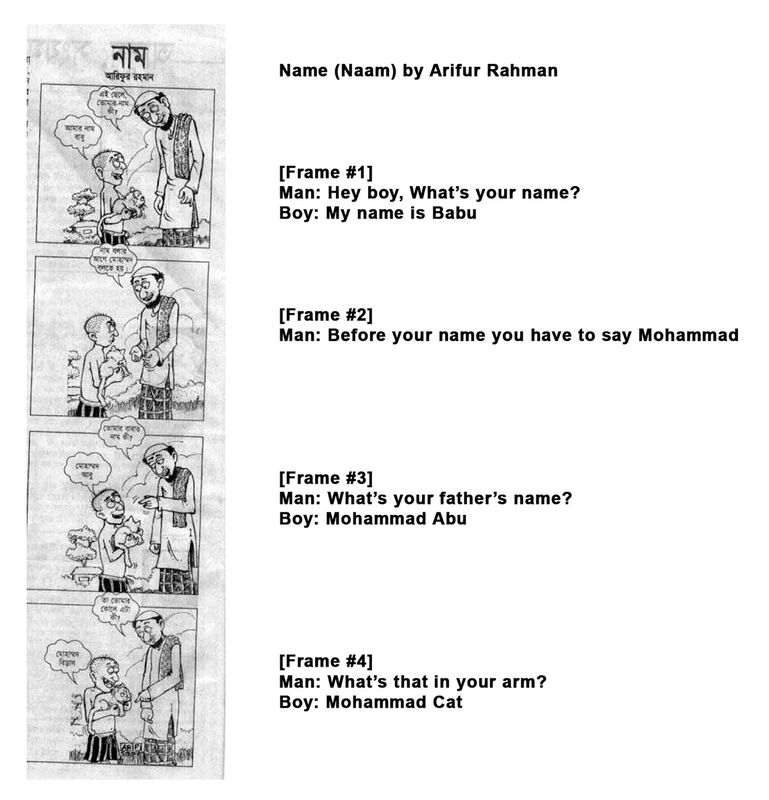 My name is Arifur Rahman, I am a Bangladeshi/Norwegian cartoonist. I live in Drøbak, Norway. In Bangladesh I am known as Cartoonist Arif, because of my cartooning activities. My first cartoon was published in 2004 in one of the Bangladeshi national newspapers. This was the beginning of my freelance cartooning. I have contributed to about 10 national newspapers in Bangladesh. I have draw for 190 episode of ''Bibek ''Animated TV Cartoon Series, since 2009 to 2010. I also worked with Election Commission Bangladesh in 2008-2009. In year 2006 to 2008 I won awards for my anti-corruption cartoons. In 2007 I was offered a job by one of the newspapers and started working for them. I draw comic series and political cartoons. In September 2007 the newspaper published one of my 4-box comic strips. The strip was about a boy being told to use the name Mohammad on a cat. Because of this drawing, there was a huge demonstration against me and my cartoon. I lost my job and I was arrested. Islamic Fundamentalist found that I had insulted their prophet, but that was not my intention. I myself am from a Muslim family and never meant to offend anyone. They demanded that I should be hanged. I also got Fatwa, they called me Murtad, which means not Muslim anymore, and in Islam someone who is allowed to be murder (killed). They thought I was supporting the Danish cartoonist who has drawn Mohammad in 2005, even our government thought so. Our government said, that I hated Muslims sensitive faith, and made problems in the entire country by one single cartoon. That’s why I was arrested and tortured. At the police station, some policemen told me that they were going hang me. My inner feelings difficult to explain. I was in detention, so I could not meet anyone from my family. In prison Islamic fundamentalist attacked me several times. They tortured me, and my right ear was seriously injured. Once Muslim fundamentalists threw human feces at my face. Inside the prison they tried to kill me several times. I consider myself lucky to be alive. At this time my cousin tried to contact lawyers but no lawyers would stand for me in court. I was rejected by everyone. 3 months later a lawyer name Sara Hossain came to meet me in prison. She said that she was going to stand for me in court for set me free. She appealed for me in the high court and even in the Supreme Court. And finally she got me free. That was 20th of March on 2008. I was in prison for 6 months and 2 days. I was freed, but not completely. I still received many death threats by Islamic Fundamentalist. Even some attacks. All the newspapers decided that they would not publish my cartoons anymore. Then I worked anonymously with an animation studio as an artist. Also as a book illustrator. In 2009 another lawyer court convicted me for the same cartoon and I was in prison for another 2 months and had to pay a fine. In 2008 I found an Islamic Sharia website. There was a list of 24 wanted people including Salman Rushdie, and I was on that list. I felt Bangladesh was not safe for me, I could be killed by Muslim extremist any time. It was not safe for me to stay in Bangladesh anymore. Cartoonist rights network international and ICORN (International cities of refuge network) helped me move to a safe country. On 1st of December 2010 I came to Norway. I came here as a guest cartoonist of ICORN in Drøbak. I was very glad to come to Norway, being able to continue drawing and being able to express my opinion more freely.